Applying truth from the Bible to everyday life! 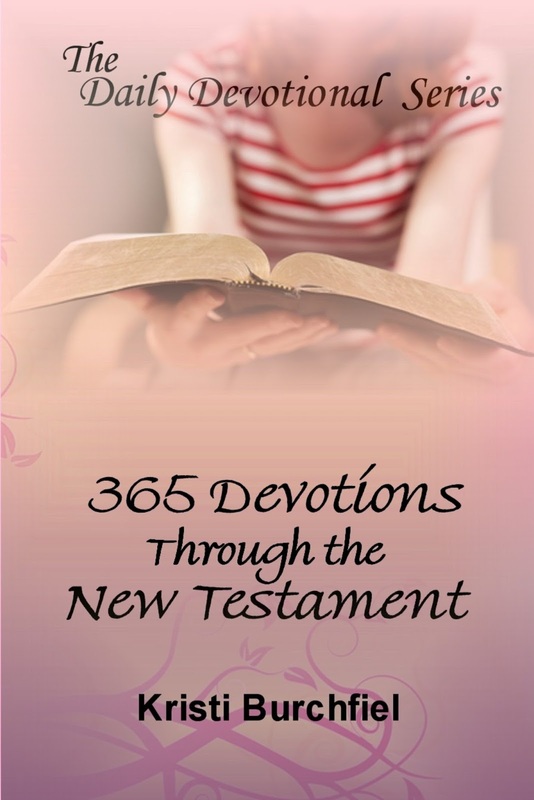 The Daily Devotional Series: 365 Devotions Through the New Testament by Kristi Burchfiel gives keen insight into the New Testament treasures and teachings. The New Testament in the Bible presents teaching and instruction for everyday life and shares the Good News of salvation in Jesus Christ. Developed as a practical 365 daily devotional to aid in applying the Word to everyday life, each day and verse sheds light on the life transforming truths of Scripture, giving inspiration and encouragement for the day. The author presents these practical truths to readers as a way to incorporate the Word of truth into their busy lives. Take 15 minutes of your day; find life and refreshment each day through the Word! Kristi Burchfiel is a passionate devotional writer and speaker. She emphasizes that devotionals serve a purpose in life, they teach us how to apply God's wisdom and truth into practical ways. Her passion is to share God's Word with others and give them tools to live life more abundantly through the application of biblical truths. Recently selected as a Finalist in the 2013 Readers' Favorite Award Contest, the devotional comes highly recommened as the author has also been named a "50 Great Writers You Should be Reading" in 2012 and has not only created the Daily Devotional Series, but 2 other amazing full length Bible Studies entitled: The Decay Within: A Study of Amos and Without Regrets: A Study of Ecclesiastes. Currently residing in Wichita, Kansas with her husband, Reverend D. Burchfiel and their two children – Kristi is one that enjoys serving the Lord with her writings and her family faithfully. For more information about the author and her books, visit Kristi Burchfiel,. You may get your copy of The Daily Devotional Series: 365 Devotions Through the New Testament at Amazon, in Kindle Edition, at Barnes and Noble at NOOK Books and other fine online bookstores. Using the power and reach of Christian Book Marketing to share Christ with the nations.